The official site for, by, and about 4-H youth in the United States. 4-H, and similar organizations, is in many countries around the world. Find about exchange programs too! Find out what's happening in 4-H throughout the United States. Buy t-shirts, books, trophies, plaques, and other 4-H stuff. 4-H Military Partners are a collaborative effort with America's communities to support children and youth impacted by deployment. The Children, Youth, and Families Education and Research Network. Lots of great links and helpful programs for youth and families, including networks in science, health, and more. If you were a 4-H member, tell us about yourself and how your 4-H involvement has impacted your life. National 4-H headquarters at the United States Department of Agriculture (USDA) in Washington, D.C. Includes lots of information about 4-H, links to other 4-H sites, and interesting activities. The history of 4-H is one of the most significant and far-reaching stories in America: a story of youth education, community pride and responsibility, personal leadership, and volunteerism. Learn more about the services available at the National 4-H Youth Conference Center. The 4-H National Directory of Materials is a searchable database of educational materials currently available throughout the Cooperative Extension System. 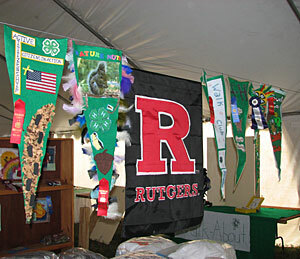 Rutgers University Collegiate 4-H Club encourages student participation in 4-H activities--primarily community service--while at Rutgers, The State University of New Jersey.